When the thermometer plummets, the days shorten, and summer cruising seems like a lifetime away, we all start thinking the same thing. Escape. 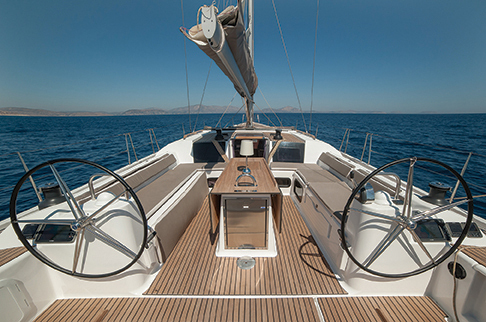 Winter cruising in warm climes is the perfect break from winter. And, right now, there’s no better place to head than the British Virgin Islands. The BVIs are some of the world’s best cruising grounds, and with plenty of flights in and out, it’s easy to get away for a week or two. Our friend, Luis Fernandez at MedCarribbean, gave us the scoop on chartering a Dufour with them. Based in Tortola, their busiest time is between Christmas and Easter, and it’s not surprising why–everyone love to escape the harsh cold winter by sailing the tropics. MedCarribbean is the only charter outfit in the BVIs with Dufour Yachts—their fleet includes four: Khitira, a Dufour 375 Grand Large; Zoe, a Dufour 410 Grand Large; Lua, a Dufour 450 Grand Large;and the newest, Noa, a Dufour 500 Grand Large. If you’re considering buying your own Dufour yacht, chartering with MedCaribbean is the perfect opportunity to try before you buy. In the midst of your island getaway, you can spend some time really getting to know the boat. Sounds like the perfect winter respite dosen’t it?